A consortium of 32 organisation from 6 countries has come together to advance the workings of virtual worlds. By creating a standard interface, the METAVERSE1 project made it possible for information to be shared between different virtual worlds and the real world and has led to the development of an international standard. 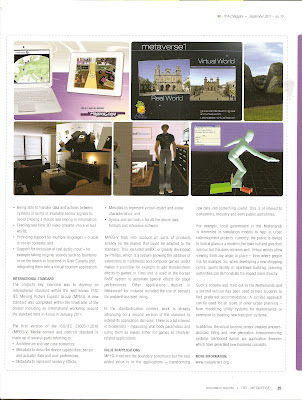 This issue include several papers from the Metaverse1 team.. 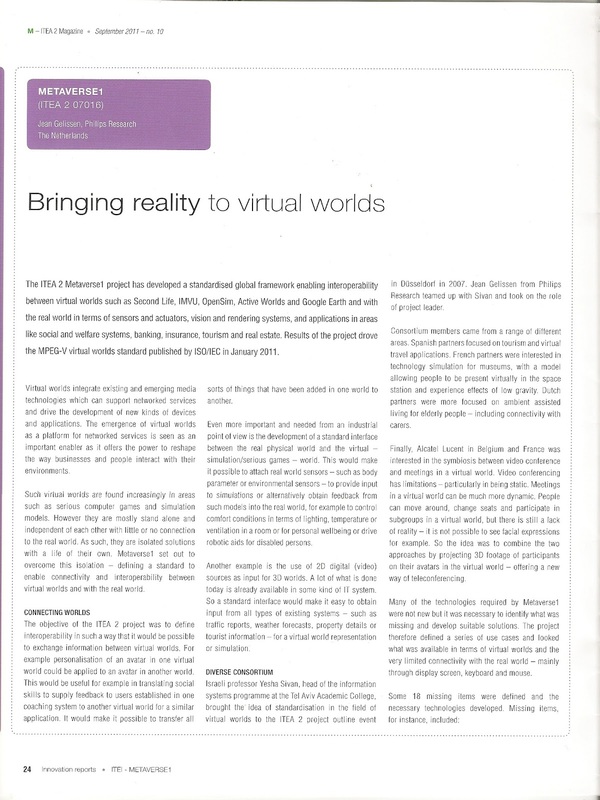 This issue focuses on standards for virtual worlds, with special relation to MPEG-V, the ISO standard for connecting within virtual worlds as well as to real worlds. Let me conclude with few editorial notes. We have started to fine tune our reviewers list. We have an initial journal plan for the next two years with firm editors to 50% of the issues. We have started to review our publishing policy for 2012. Today the Metaverse1 project received the Silver 2011 ITEA2 Outstanding Achievement Award at the ITEA2 / Artemis co-summit in Helsinki ... after my plenary project presentation I accepted the award on behalf of all of you ... the work package leaders will receive (by surface mail) an engraved silver medal and accompanying document as well ... this was the last formal action / event of our project and a very good achievement as there were some 15 candidate projects !!! Once again, many thanks to all of you for all your support in this very challenging and successful project !! Members of the Metaverse1 project participated in the 3D3CWorlds in Israel. The meeting was chaired by Dr. Yesha Sivan, of Metaverse Labs, and Jean H.A. Gelissen of Philips research. 2. Vision - The Challenge (Video) (See more details). 3D3C Worlds will change, enhance, and at times hamper, how we learn, enjoy, work, and perform other human actions. High levels of 3D3C (3D, Community, Creation, and Commerce) must be attained in order to harness the potential. This event will benefit from the fruits of research conducted by the members of the Meraverse1 consortia. Virtual worlds integrate existing and emerging (media) technologies that allow for the support of existing and the development of new kinds of networked services. The emergence of virtual worlds as platforms for networked services is recognized by businesses as an important enabler as it offers the power to reshape the way companies interact with their environments. Virtual worlds are a new way for people to communicate, to meet and to socialize. They are now pushing the boundaries of multilingual communication. The need for multilingual support is increasing every day making virtual worlds a very good example of fields of development where applications supporting multilinguality are becoming an absolute necessity. In order to enhance interoperability between virtual worlds, applications and corpora, it is obvious that standards should come into place. This is the main goal of MLIF and, on a more global perspective, of the Metaverse1 project. • ADML- Avatar Definition Markup Language. Presence has been studied for employees as well as family members or friends. • Employees working together on a single project from different locations are often missing the social interactions that their colleagues have when in the same location. PresenceScape brings these employees together again in a single virtual location where they can feel together, have the capability to start informal communications at any time about any subject and provide more detailed presence information about the task they are doing. • A group of friends or family members that live apart and want to spend pastime together from the comfort of their homes can do this in a 3D virtual location on the Internet. Instead of being represented by avatars, the Alcatel-Lucent solution represents friends and family members by their streaming stereo image, allowing them to express facial emotions and gestures without the need to handle keyboard or mouse. Both solutions have been guided by extensive formative user research. • interactions (motion capture, metaphors, avatar high-level control …). Current developments and recent trends in the gaming industry are turning this technology into an attractive proposition for Virtual Worlds. In Metaverse1, this has been developed to enhance the feeling of social presence through sharing unusual experience. Virtual Worlds are about Interaction between real and virtual humans. Talking and listening, body language, facial expressions are all vital. Behavior Markup Language is the “HTML” for controlling virtual humans in this respect. The Human Media Interaction group from the University of Twente, Netherlands, is implementing and using these techniques for applications like Virtual Guides, Sports Coaches, Health applications, or Caretaking. WSN-SI is a shared infrastructure for Wireless Sensor Networks and can be used for indoor localization, sensor integration etc. WSN-SI is invented by Joost van Velzen and Houwer de Gues of SallandElectronics BV. WSN in general is a promising technology for different kind of applications such as; building- , industrial- and agricultural automation. It also can play a major role in low level integration for the Internet Of Things and perhaps will evolve in a new standard. Navigating within a virtual world can be hard, especially for novice users. We provide automatic navigation through the world without directly controlling the motion of the avatar. Besides steering a single avatar, our technique can be used for steering thousands of non-player characters in real-time. The novelty is that we can efficiently create a 3D dynamic navigation mesh for a layered environment which can be used by characters to generate visually convincing paths in real-time. GeoSim integrated Virtual Cities are mirror replicas of real cities (‘3D-Mirror Worlds’), in which you can navigate, get useful info or network with other users. By accomplishing a remarkable 10X reduction in modeling cost and schedule GeoSim defines the leading edge of high-precision, large-scale 3D-modeling. Every month, Alcatel-Lucent puts the spotlights on a person or team for their contributions to the company in terms of innovation. This time, team members of the Visual Communication Department were selected for their work on Mixed Reality, a solution that paints partial 3D live images of people inside virtual worlds as a replacement for avatars. 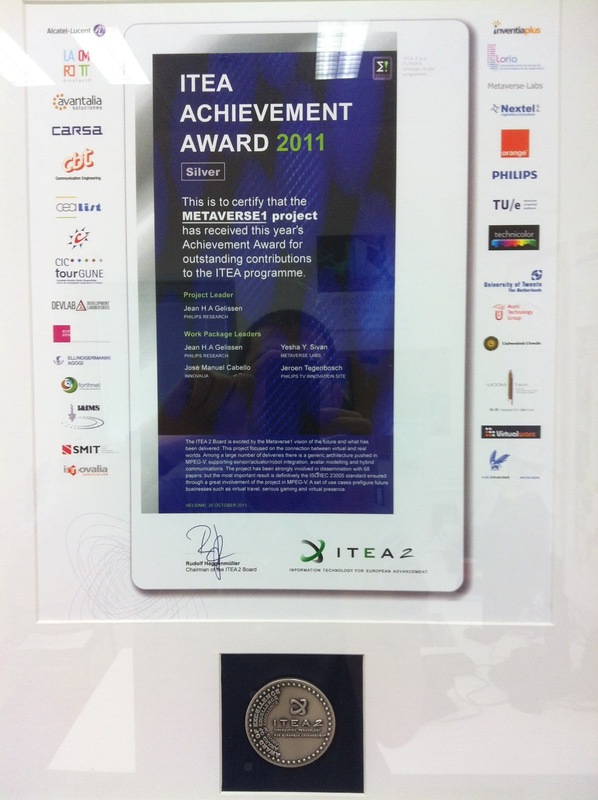 The realization was just one of the objectives of the team within the ITEA2 Metaverse1 project. Here's a couple of images from the article as it appeared in the Alcatel-Lucent April newspaper providing more details about the solution. The referenced video's are not yet publicly available. Check out the June issue of the Bell Labs Technical Journal for more info. 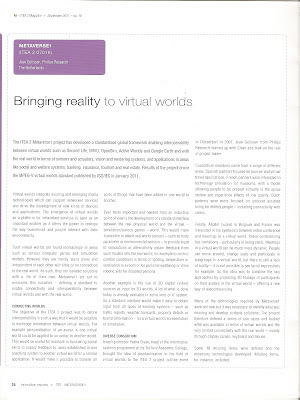 The METAVERSE project emerged from the ITEA PO Preparation Days in Germany in 2007. Yesha Sivan, who is also the head of the information systems programme at the Tel Aviv Academic College, presented the field of virtual worlds as one in need of standardisation. “Mobile phones started in the USA but took off with European standardisation efforts in the GSM forum,” he points out. The same type of approach was needed to virtual worlds for European leadership. economy of virtual goods, sociology and the nature of communities, and law – copyrights and ownership – to biology, such as new brain based human-computer interfaces, computer science and mathematics, particularly algorithms for 3D rendering and animation. Israeli think tank Metaverse Labs and its founder Dr. Yesha Sivan have played a major role in the success of the METAVERSE1 ITEA 2 project that has resulted in MPEG-V a global standard on connecting real and virtual worlds. Such worlds are basically a combination of 3D and 3C. The former involves a representation of 3D worlds in which it is possible to walk in an immersive way. The latter stands for three concepts: community in the form of a more advanced type of Facebook social networking; creation with the ability to create mainly digitally-oriented artefacts; and commerce by making it possible to make money out of it – the Internet originally was not money making but now Amazon and similar web organisations have changed the concept. 3. It led to the establishment of extremely strong links between the various partners which are already resulting in new co-operations. The 1st International MPEG-V Workshop and Demonstration Day 2011 was organised in parallel with the 95th MPEG meeting on 25 and 26 January, 2011 in the Inter-Burgo Exco hotel in, Daegu, Korea. The purpose of this event was to present and demonstrate MPEG-V, a new standard in the MPEG range and published by ISO in November 2010. This new standard is the frst version of ISO/IEC 23005 (MPEG-V, Exchange with Virtual Worlds) initiated by the ITEA 2 Metavese1 project and co-created with a large number of partners of the Metaverse1 consortium and several companies; institutes and universities from Europe, Korea and Japan. MPEG-V-based products and applications enable multi-sensorial user experience and interchange between virtual worlds. ▪ Metadata to represent virtual-object and avatar characteristics. The MPEG-V awareness day was particularly targeted to developers of products and application for multi-sensorial user experience, content creators, broadcasters, multimedia device manufacturers, sensor and actuator manufacturers, virtual worlds and online game developers, and those interested in new opportunities in digital media.